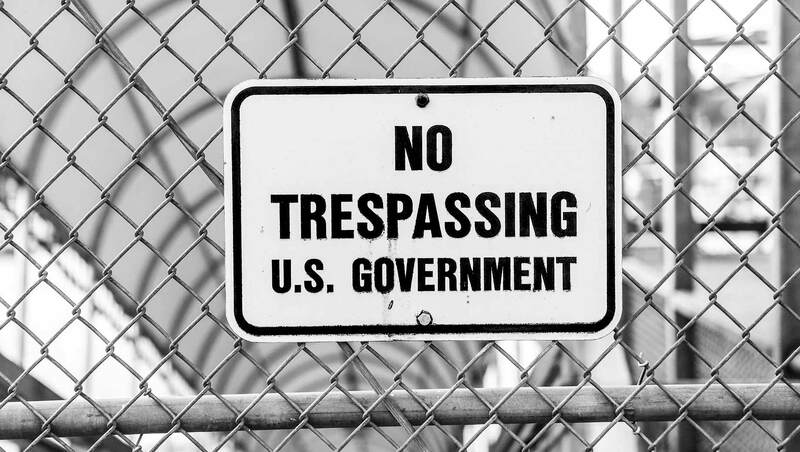 WASHINGTON, D.C. -- Thirty-nine percent of Americans believe there is too much government regulation of business and industry, the lowest level in a decade. A third (33%) say there is the right amount of regulation, the highest percentage in 11 years, and a quarter (25%) say there is too little. The drop in the number who think there is too much regulation is occurring as President Donald Trump continues his drive to roll back federal regulations -- a key promise of his 2016 campaign. Trump has boasted of the success of his efforts, including his disputed claim earlier this year that "No president has ever cut so many regulations in their entire term … as we have cut in less than a year." A major target of the cuts has been regulations put into place by Trump's predecessor, Barack Obama, including key changes on environmental, financial and civil rights issues. 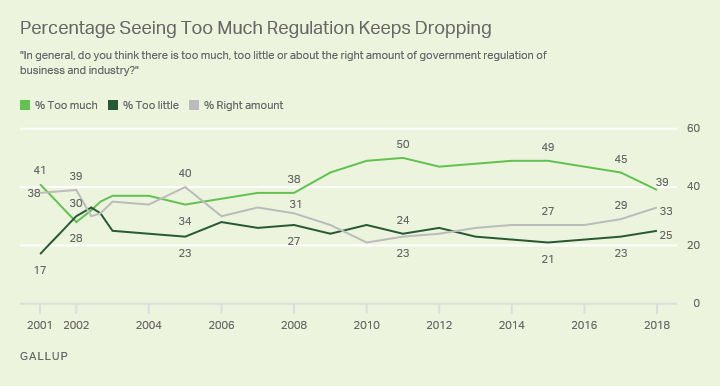 The percentage of Americans saying there is "too much regulation" rose from an average 37% over the eight years of George W. Bush's presidency (2001-2008) to an average 48% for Obama's eight years in office (2009-2016). The transition to Trump did not change attitudes much in his first year as president -- from 47% saying "too much regulation" in 2016 to 45% in 2017. This year, the change was more pronounced -- a six-percentage-point drop to 39%. The pattern has been somewhat different for those who hold the opposite opinion -- that there is too little regulation. The 25% who now say there is too little is only one point above the average of 24% for the Obama presidency. Most of the change since Obama left office has occurred in the percentage saying there is the right amount of regulation, now at 33% -- up from an average 25% under Obama. The question is included in Gallup's Governance poll, which since 2001 has annually measured the public's views on the role of government and how well federal, state and local governments are performing. This year it was conducted Sept. 4-12. Fewer Republicans Say "Too Much" Regulation, More Democrats Say "Too Little"
Republicans and independents who lean toward the Republican Party are driving the decline in the number of Americans thinking the government regulates business and industry too much. While the percentage of Democrats and Democratic leaners saying there is too much regulation has hardly changed since Trump took office in January 2017, the percentage of Republicans has dropped from 74% in 2016 to 57% now. Conversely, while the percentage of Republicans thinking there is too little regulation has stayed about the same over the past three years, the percentage of Democrats and Democratic leaners saying this has risen from 34% in 2016 to 42% now. 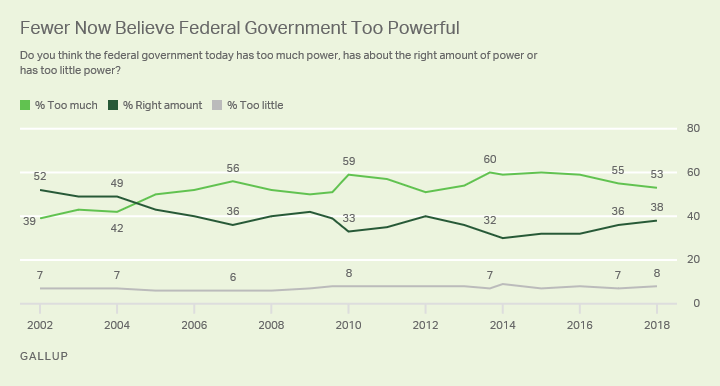 In response to a related question on the same Gallup Governance poll, a slight majority (53%) of Americans think the federal government has too much power, down from 60% in 2015 and 55% last year. When Gallup first asked the question in September 2002, one year after the 9/11 attacks that left the nation rallying around government leaders and institutions, Americans were more likely to say the federal government had about the right amount of power (52%) than to say it had too much power (39%). By 2005, the number saying "too much power" had grown to 50%, and it has been at or above 50% in every year since. The percentage believing the federal government has too much power peaked at 60% in 2013 and 2015. Democrats and Democratic leaners were more likely to think the federal government had about the right amount of power (49%) in 2016 than to think it had too much power (36%). Now a larger percentage say it has too much power (47%) than that it has about the right amount (41%). Among Republicans and leaners, the percentage saying "too much power" has shrunk significantly -- from 82% in 2016 to 57% now. As Trump continues to push forward with his program to reduce federal regulations, now well into its second year, Americans have become less likely to perceive a regulatory burden. Considerably fewer Americans think there is too much government regulation of business and industry than felt that way during the Obama presidency, and the percentage of Americans saying the nation has about the right amount of government regulations has climbed a few points. However, there is a burgeoning movement within the Democratic Party to expand government's role in a way that would inevitably bring more regulations, and Democrats have become more receptive over the past two years to the idea that more regulations are needed. With Trump and other Republican leaders arguing that winnowing down regulations will boost the economy, while prominent Democrats such as Massachusetts Sen. Elizabeth Warren contend that Americans need the government to protect them through such regulations, the stage is set for an ongoing series of battles that will most likely extend through the 2020 presidential campaign.